I love the low-fi chunter of Mo-Dettes records. The all-female band combined the sassy feminism of The Slits with the choral shouting of The Raincoats. That’s why I have all their records from the early 1980s, starting with MODE1 White Mice 7″ distributed by Rough Trade. Most of the copies of this 7″ are Porky Prime Cuts, with inscriptions like Mo-defy and Mo-deviate on the runout grooves. It’s a happy sound recorded in Wales at Foel Studios and released on their own label. The original members of the band, Kate Korris, Ramona Carlier and June Miles-Kingston are known for their work with other bands before and since, including The Slits, The Raincoats, Kleenex, Funboy Three, The Communards. But in 1979, the big record companies were on the lookout for new, punky acts to promote. So, with John Peel a big fan, Decca Records signed Mo-Dettes and the next bit is an all too common story here on PGD. The thinking goes – put the girls with a big name producer who will knock ’em into shape and make a great commercial album. Step up Roger Lomas. After a background in soul producing, he was the top name in ska – having just successfully produced The Specials and Bad Manners. You can see a problem; I can see a problem. 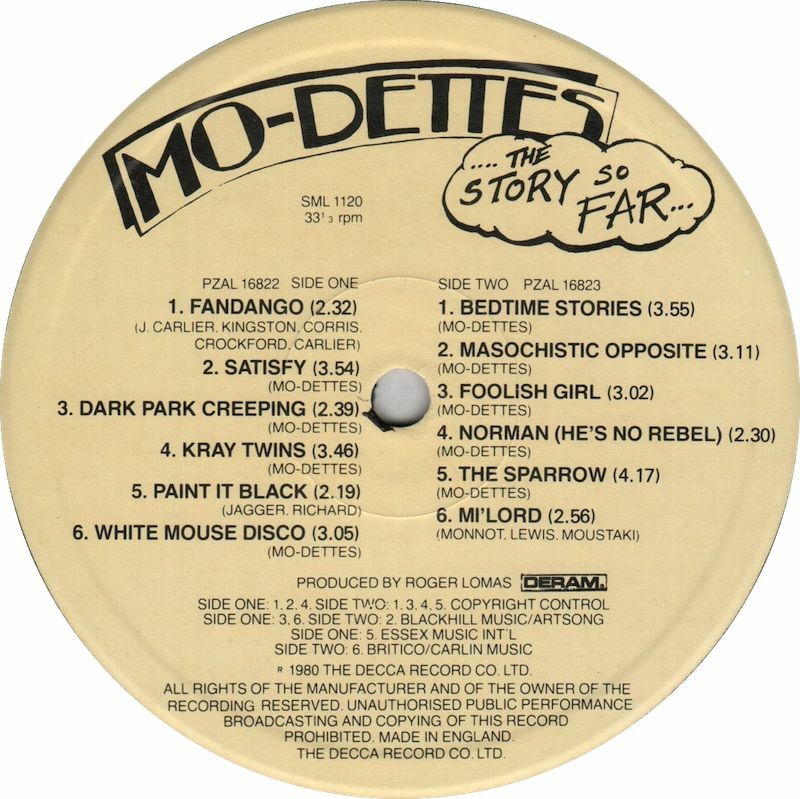 Mo-Dettes came from the punk tradition. And they were girls. They weren’t a bunch of session guys playing traditional-style songs…..
What we’d like you to consider today is, how different would The Mo-Dettes’ career have been if, in 1979, Decca had put them in a studio with a sympathetic female record producer? Only one problem, there probably weren’t any. A proper punkgirl salute goes out to all of the Mo-dettes; if only……. As much wasted potential there was in the Mo-Dettes early work with Lomas did you hear the final single [“Tonight”] with Chris Neil producing? Perry Haines styled them to look like The Go-Gos on the cover of that one. “White Mice” is still the best.